With all the focus on Thanksgiving dinner, we decided to find the best way to start your Thanksgiving morning, without adding too much prep time to your already packed day. This means our Thanksgiving breakfast would have to be something that you can make ahead. And we also wanted something that would give you the energy to get going and keep going, without taking up too much precious turkey space. Enter, Bon Appetit’s Baked Oatmeal with Warm Cranberry-Apple Sauce. This baked oatmeal is the make-ahead breakfast your holiday plans need—it’s easy to execute and feeds a crowd. Substitute coconut oil and your favorite alternative milk to make it dairy-free. Oats, pecans, pumpkin seeds, almonds, cinnamon, and cardamom come together to create a nutty, spiced base that’s filled with delicious texture. Combine all of them together in a large bowl, mix in some milk, honey, eggs, and butter, then put it in the oven and bake until it’s golden brown. Top it off with a surprisingly easy-to-make compote reduction of apples, cranberries, honey, and cinnamon, all warm and simmering in a saucepan. Finally, serve it with a small serving of yogurt alongside. This golden-brown baked oatmeal is the perfect way to start off your Thanksgiving morning with a warm, crowd-pleasing breakfast that will help fuel your day. 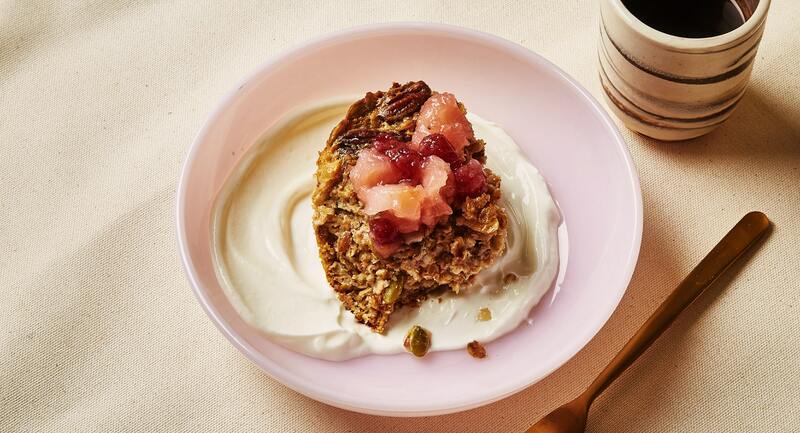 Get the recipe here: Baked Oatmeal with Warm Cranberry-Apple Sauce | Bon Appetit.